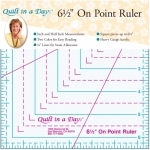 The On Point Quilt Ruler creates accurate square on point patches quickly and easily. The Ruler has 4 cutting edges, all with 1/4" seam allowances for a perfect fit in your block. The Ruler was designed to make Eleanor Burns' Signature Patterns "Autumn Leaves" and "Opposites Attract." 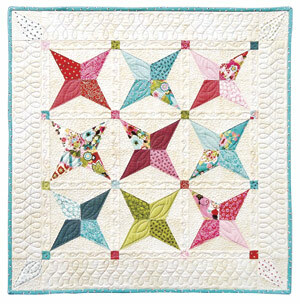 You can also use the ruler for the Churn Dash and Sawtooth Star quilt blocks. In addition to fully illustrated and detailed instructions, a free pattern "Kylee's Kite", 36" square wall hanging quilt, is included free with the Ruler. The Ruler is made of heavy gauge acrylic and is laser precise.